Scientific research has confirmed that, all else equal, the lack of light during the fall season affects the process of thinking among humans. The bus line we frequent on a daily basis, the city corner where we find comfort, the youthful buzz of a Friday night and the peaceful silence of a Sunday morning, the traffic jams, and what not, are some of the factors that affect our perception of the city we live in. Whatever spark incites our neurons, at the end of the day, Prishtina remains the place where we find warmth, comfort, and pleasure. Or not?! It all depends on our point of view, but what makes us similar is the fact that we all go through the process of thinking. The focus of this edition was this very same process. Discussions regarding the human mind, the process of thinking, but also about criminal minds and the impossibility of articulating our opinions into words, were raised last Wednesday at the Oda Theatre. 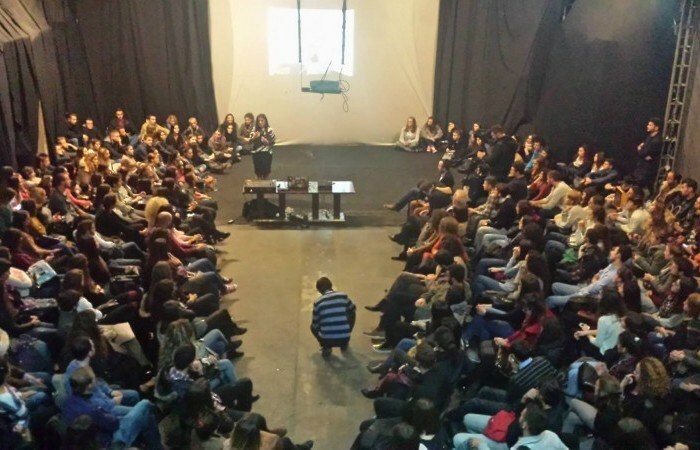 The thirty-second edition of BarCamp Prishtina brought three speakers: Anisa Hasani, Granit Shatri, and Daut Demaku. As usual, BarCamp tried to instill innovation and inspire the audience by offering them inspiring stories and generating debates in regards to any relevant topic. Due to the abundance of participants, the warm environment within the Oda Theatre was also used as its name suggests – odë, roughly translated in English as a chamber. Anisa Hasani, once a young girl who was mocked for not expressing words correctly, today a capable therapist, brought to BarCamp Prishtina her journey throughout the years. Anisa talked about the obstacles that clients face in terms of articulating words, as well as the emotions that she feels whenever her work helps them overcome these difficulties. “You should never be discouraged by your gender or age, always seek to be respected for what you are and to follow your own dreams,” said Anisa, as she herself made her dream a reality. Granit Shatri, a psychologist, psychotherapist, publicist and poet in the making, brought his experience from literature, mythology, religion, ethnology up to psychology at BarCamp. Granit started to work as the coordinator of mental health in the prisons of Kosovo at the young age of 21. “This made me understand what the difference between our minds and criminal ones is.” Speaking of the uniqueness of the human mind, Granit said that “humans are the only species which has the capacity to sit down and ask oneself: Who am I?” He continued explaining that having a clear thought means that it has probably been imposed by someone else, while disturbing your own thoughts means that you have built some thoughts of your own. BarCamp continues to be the focal point where people with ideas meet. Get your thinking mood on, trouble your mind, and put your ideas into actions!